Clear quartz crystal has been called the universal stone. Quartz contains the four elements of creation. It helps us amplify, direct, focus, transmit and store energy. Everyone interested in stones should have some! It corresponds to all of the zodiac signs, and is a pure and powerful energy source. It receives, activates, stores, transmits, and amplifies energy. It stimulates brain functions and activates all levels of consciousness. It is excellent for meditation and is said to bring harmony to the soul. Its greatest attribute is known to be its use as an aid to opening the psychic centers, enabling the ability to meditate at a deeper level and to free one's mind from the mundane and the trivia. 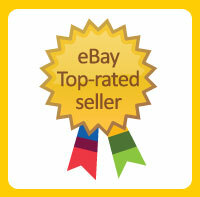 It releases the higher consciousness and develops mystical and spiritual gifts. It is particularly useful for meditation and when working to contact or align with one's higher self. It is said to protect against harmful electrical vibrations and assist the wearer to think intuitively. Quartz and its various sub-varieties has been employed by humans and their predecessors, the Neanderthals, for tens of thousands of years. Used to fashion tools, (sub-variety flint) it was also used as talismans, wands and amulets to aid in protection and healing. Crystals emit vibrations that affect the wearer’s body. Certain specific varieties are believed to have positive effects when utilized on particular energy centers of the body, much like deep therapeutic massage and acupuncture. These energy centers are known as Chakras. Quartz has a long and lengthy history with regards to spiritual uses. Spiritually inclined societies used it for balancing chakras, transforming energy and a host of other metaphysical uses. Quartz crystals are used to this day in meditation, as they are believed to possess healing properties and other metaphysical capabilities. It has been used throughout the centuries to divine the future and commune with spirits--this belief spans many cultures including Western, Chinese, Medieval European and Celtic. The stone's ability to align one's psychic self with the cosmos is often ascribed to the stone's piezoelectric properties - which means that it becomes electrically charged under pressure. Quartz is also pyroelectric - heating quartz also charges the stone electrically. Many believe that in the same way quartz is used in computer chips to transmit information, it can also be used to commune with the spirit world, higher spirits and angel guides. It is often said to "amplify" psychic power. The Record Keeper or Recorder Crystal is identified by one or more raised triangular shapes on a crystal’s face. They are thought to have been programmed by ancient Atlanteans and Lemurians to safeguard their sacred and profound secrets. They are filled with wisdom & esoteric knowledge. You can place them over the Third Eye to meditate or hold firmly, but not tightly and ask to access your personal wisdom. You need have no experience with crystals to use them - just a sincere desire and an open heart. They promote peace and harmony. Quartz in the shape of a Scepters: Scepters are points that form naturally around a rod of crystal. They strongly transmit energy in the direction of the point. They are a symbol of power (ie., the scepters of royalty) and bring a higher spiritual energy to all ceremonies and rituals. They are thought to have been used by Atlantians & Lemurians for healing ceremonies. They represent fertility. When Chlorite combines with the energy of the quartz crystal, it is one of the most powerful healing minerals. It is used to stimulate inspiration actualization. Quartz with Chlorite carries the energy of the Angels. The Rainbows in Crystals are thought to be able to manifest some of the purest energies on earth and take the user to higher realms. They can help with Lucid dreaming and bring understanding of dreams. Some believe that these crystals exhibit the closest manifestation of pure white light that can be experienced on the physical plane. Rainbow crystals are used during meditation to and bring depth and clarity to dreams and move through negativity. Faden quartz grew in two directions simultaneously, so is typically made up of many double terminated crystals. Where the growth started you can see a string of bubbles that show up as a white "line." This white line is the hallmark of a faden crystal (pronounced "fah-den"). It seems to always take a tabular formation (flattened), and is usually Double or Multiple Terminated. Tangerine Quartz works with the first and second chakra energies. It helps to balance their energy and express them appropriately, which includes control issues and the sexual organs. It represents the balance of yin and yang and works to assist us with expressing our natural creativity. You need to consciously work with this energy. Dendritic Quartz looks like it has ferns or other organic growths inside. It combines the many useful qualities of Clear Quartz with Manganese, which is the actual mineral content of the "plant life" within this stone. It facilitates a harmonious relationship with Mother Earth, and a deeper connection with nature, including the nature spirits. It is also used for facilitating Past Life recall and used to open and activate the third eye. Highly prized for their healing ability, these crystals are used by Shamans for balancing the aura and repelling negative energies and entities. Its vibration is used to get to the root or base of a problem so that you can see what the solution to the situation is – thus a very valuable resource indeed for all Crystal Healers. This type of crystal is also thought to bring strength, stability, spiritual growth and calm reason. Tourmilated quartz - The energies of the Tourmaline are amplified and intensified by the quartz. This is considered a real healing stone on all levels. It is a protective and Grounding combination and is thought to transform and transmute fear, stress and anger, bringing in positive energies to replace them. Thought to be an excellent stone for Chemotherapy and radiation patients! It is said to strengthen the immune system and balance the physical as well as the various subtle bodies. Black Tourmaline is also used to repel negativity and psychic attack. It is often used to combat negative effects from EMF radiation from TVs, monitors, etc. Elestial Quartz: Elestials are a rare form of quartz. They are not for everyone, since they do work with a much higher vibration than regular quartz. Elestials are quite unusual to look at and different in their formations and structure than other crystals. Often called the "Enchanted Crystal," or the "Crystal of the Angels" which explains the strong link with the Archangelic energies. They are also referred to as “New Millennium Crystals.” They work on a higher octave of energy than regular quartz. Elestials assist one in overcoming emotional burdens and are especially good for people who are working on integrating the intellect and the heart and working through emotional trauma from early childhood or past lives. They assist by transmitting information about the past, present and future, via the person's "high-self." An Elestial can be used during times of change and transformation to help to stabilize and transmute the energies. They are also used to uncover hidden secrets. An excellent tool when learning to drop one’s attachments. It’s good to use with a piece of fluorite, as that will help you to keep things on a practical level. Elestial Quartz is also known as Skeletal Quartz and Jacaré or Alligator Quartz. Jacaré, means Alligator in Portuguese and refers to the patterns in the surface of many of these crystals. The mineralogical term, Skeletal Quartz, refers to the fact that you can see into the internal matrix of the crystal – the edges and planes of the crystal. There are many unusual cavities and etchings on the crystal. Sometimes the cavities are filled with ancient clay and/or water! There is often a wonderful interplay of light within the crystal. Spirit Quartz is an incredible crystal! Spirit Quartz is a generator stone and can be used to transmit subtle healing energies. These energies can also assist in a stronger and more aware connection to one’s High-Self, as it is an energy of Oneness - oneness with self as well as with others. It is used in meditation and contemplation to assist in understanding and resolving group and family issues. It promotes harmony and peace and can provide insights into issues and assist in developing healthy connections with loved ones. It is a crystal of compassion and is excellent in grief therapy work. Generator crystals are used to cleanse and balance chakras, and the subtle bodies. They act to help disperse negative energies and replace it with more balanced energy. Natural generators and crystals that have been polished in the configuration of generators have similar properties and can be used in the same manner. Wands are used to focus our energy and gain clarity. A wand may be more powerful than an uncut crystal, especially when used by a healer to direct and focus healing energy. Vogel Shaped Quartz This is a Quartz Crystal Wand cut in the style of a Vogel wand. The Vogel cut crystal is named after Marcel Vogel who designed the very precise cuts on quartz so that it acts as a very efficient, almost laser like focusing tool. When used with intention and unconditional love, this shape can really focus your energy for healing work or anything that you are working on transforming. It is not an actual Vogel, rather it is cut in the Vogel pattern. An original Vogel crystal is cut extremely precisely, and would cost hundreds or even thousands of dollars. However, I think you will find that this crystal is a great tool in it’s own right. Star Quartz is also known as the "Blessings Crystal." Star Quartz is a very powerful crystal, protective and gentle, used to disperse negative energy from your auric field and in your immediate area. They are said to contain information from higher beings that came from the stars. A very different type of energy! The 'stars' are thought to be hollandite. Multiple Crystals clustered around the main point, this configuration is said to be the 'teacher and students' by some indigenous cultures. Phantom Quartz occurs when several points start to grow over one another, in the same area - sometimes with other minerals showing in the various layers. Phantom Crystals are associated with the awareness of how all life is connected. It’s been used to assist in clairvoyance. Polished and unpolished specimens are both excellent. Polishing often brings out the beauty in the crystal and instills appreciation for the hidden or the past. This is a crystal often used when seeking answers about Past Life connections. It’s said that a phantom crystal can also be used to help a person to meet their spiritual guide or Angel. Some Healers have used them to help with hearing disorders. Double Terminated Quartz Protects the mental and physical bodies. Double Terminated crystals are multi-functional; energy moves outward in either direction or in both directions concurrently. They have the capacity to draw or transmit energy through both ends. astral projection and for lucid dreaming by placing them under your pillow at night. They are also excellent for use during meditation. A Manifestation Crystal is a larger crystal that completely encloses another, smaller crystal. They are used to heal traumas from childhood, especially blocked memories. They are used to work with family problems and issues. Especially good for manifesting visions, and gaining clarity. 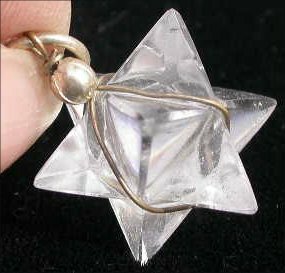 Merkaba shape, carved quartz or other gemstone. Working with a Merkaba carved rock quartz geometric shapes supports ones inner explorations and awareness. "Merkaba" is an ancient Egyptian word to describe the energy or Aura that surrounds all living Beings. slow your Merkaba. Merkaba meditations are thought to facilitate spiritual growth and strengthen your creative abilities. They are also used when one wishes to create a positive change in life. as well as between ones self and other spiritual Realms. A Bridge crystal is also useful for teachers, as it is said to support understanding and help build connections between the teacher and student. It is also useful when communicating with others about any kinds of metaphysical or spiritual concepts. Lemurian Seed Crystals - Lemurian seed crystals are unique in many ways. They are found in sand banks, and not in clusters or clay, as quartz is normally found growing. It is believed that they were left there purposely, cushioned in the sand banks, holding and preserving the knowledge of the advanced and ancient Lemurian civilization. Each crystal is said to hold data and a message of unconditional love. Furthermore, each one is connected to all of the others, through and beyond, space and time. They are commonly used for channeling work, chakra balancing and clearing, lucid dreaming, and working towards oneness in the world and in self. Their subtle energy is incredibly strong, and looks are no indication of power. I've seen crystals that are not at all lovely to look at - but are some of the most powerful and active tools that I've ever seen. Just an amazing energy - more than you can imagine. Russian Lemurian Crystals were found in rugged caves in Russia, tumbled by numerous earthquakes and fractured by many geological upheavals. Over the eons, these crystals continued to grow and many are self-healed, with elestials and multiple terminations. The Russian Lemurians have been called "Master Healing Crystals" and also "The Sacred Scribes." These crystals contain information about healing on all levels, as well as ancient information about the lost civilizations. They, like all Lemurian crystals, are said to be connected via other planes to one another, through and beyond time and space.